T-R PHOTO BY THORN COMPTON - The GMG boys basketball team piles on Brock Baldazo after he hit the game-winning shot at the buzzer to defeat BGM, 105-103, in double overtime on Friday in Garwin. Baldazo finished the game with a double-double of 12 points and 15 rebounds. 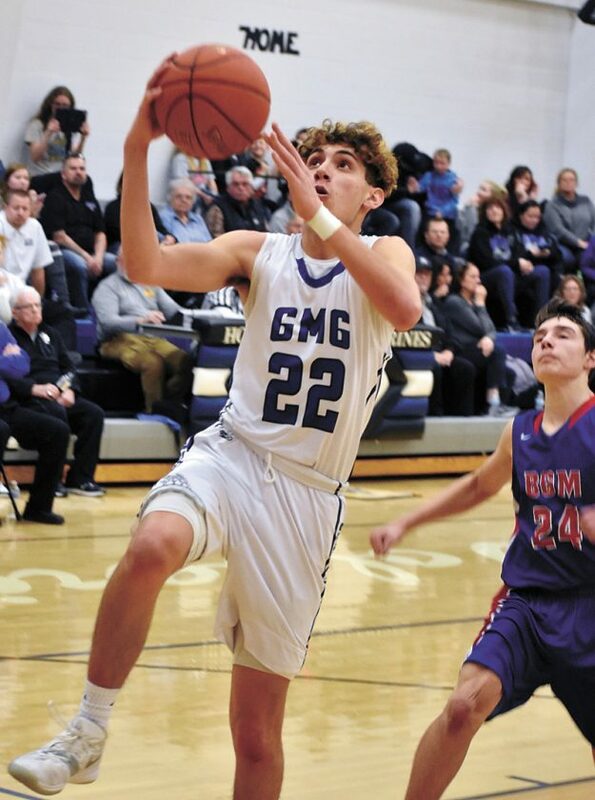 GARWIN — With time running down in the second overtime of Friday’s game between the GMG boys basketball team and BGM, the Wolverines had the ball with the score tied at 103-103. Brayden Peterson ran the clock down so their shot would be the final of the quarter, meaning either GMG would win or we’d be heading to a third extra period. With five seconds left the Wolverines got their shot, but it missed to the left of the cup. Senior Brock Baldazo was right there for the offensive rebound, however, and after pulling down the board he turned and heaved up a prayer. The buzzer sounded and the ball dropped through, and madness erupted on the court as Baldazo’s teammates swarmed him for giving GMG the 105-103, double-overtime victory over the Bears. Baldazo said he originally never intended to put up the shot that will be remembered in Garwin for quite some time. T-R PHOTO BY THORN COMPTON - GMG defenders, from left, Kolton Gill, Brock Baldazo and Brayden Peterson lock down BGM’s Kyle Cadden during the second half of the Wolverine’s 105-103 double-overtime victory over the Bears in Garwin on Friday. 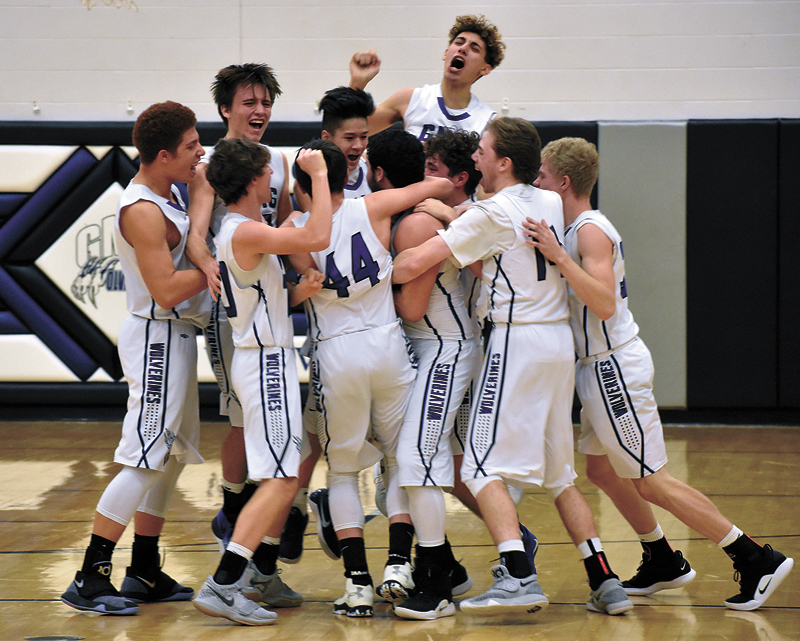 Pulling off the upset over one of the hottest teams in the state, considering BGM had won 10 of its last 12 games, was incredible, but Wolverine head coach Michael Plett said it meant even more to his squad considering their fate in close games lately. “I was going through out stats the last few years, we are like 0-8 or 0-9 in games decided by under 10 points,” Plett said. “I am so happy for us to finally get a reward for the hard work that we’ve been putting in because we do have a really nice time, we do have really great players and hopefully this will give people and opportunity to see that even though we’ve let a number of them the last two or three years slip away. While Baldazo was the ultimate hero, he wasn’t the only one wearing a cape for GMG on the night. Aaron Fleming had a career-high 29 points, breaking his previous career best of 24, and his biggest shot came at the end of regulation. The Wolverines (9-9) trailed 83-80 to BGM (13-7) with less than 20 seconds remaining. Fleming had a hot hand earlier in the game, scoring 15 points in the first quarter alone, but he had cooled off a bit in the second half. With 10 seconds left, Fleming got an open look at the basket but ended up missing to the left. Luckily Justin Savadty, who had an incredible fourth quarter as well, was there for the rebound and he found Fleming again, who squared up and hit the 3-pointer this time to even the game at 83-all with seven seconds left in regulation. 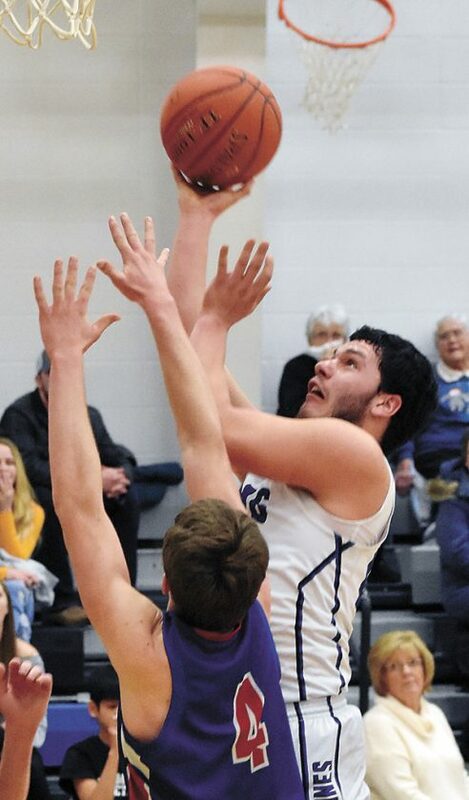 In GMG’s prior game against East Marshall, a 69-66 overtime loss, Fleming had a chance at sending the game to another overtime but missed, so he said it felt nice to get some redemption. 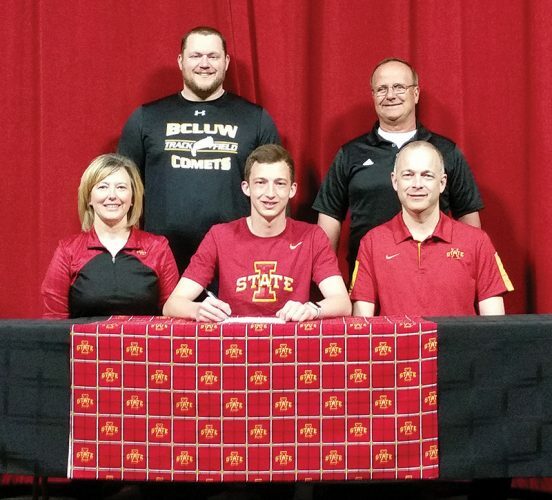 As for getting his career-high in such a big way, he said that was better than the two previous times he put up 24 points. “Both of the other times I had 24 was in losing efforts, so it’s much better to do it in a winning effort today,” he said. Fleming might have hit the tying shot, but the fourth quarter belonged to Savadty. In the opening seconds of the third quarter Savadty took a shot to the face that busted his nose and he had to go back to the locker room to stop the bleeding. He came back midway through the third quarter, which was key for the Wolverines. Savadty nearly couldn’t miss in the fourth, he drilled four 3-pointers and finished the quarter with 14 points, giving him 20 for the game. Despite such great scoring efforts, once again Brayden Peterson was the team leader in points with 30, however. 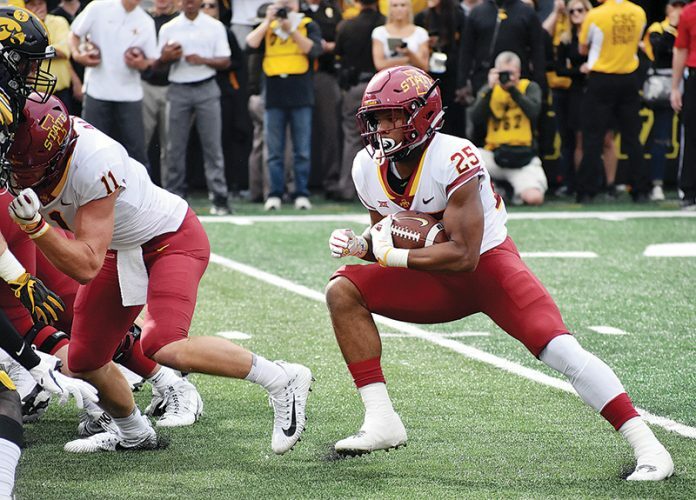 Peterson only had three points at halftime but exploded four 27 in the second half and overtime, scoring nine of the team’s 12 points in the first overtime period. Plett said he knows Peterson can get it done, but it was good to see his supporting cast lift him up as well. Peterson also added eight rebounds and eight assists to his 30 points. Baldazo had a double-double of 12 points and a team-high 15 rebounds, with many of those coming on the offensive end in the fourth quarter and overtime to keep the Wolverines’ hope alive. BGM had some great scorers of their own, with Kyle Cadden going for 30 points and Noah Beck and Grant Hall each finishing with 17. Beck was unstoppable in the first overtime period, scoring all 12 of the Bears’ points in the four minutes, but he fouled out in the second overtime, which opened the door for GMG’s win. Plett said oddly enough in a game where 208 total points were scored it was the defensive effort from his guys that led to their win. GMG now has one last game against North Tama on its schedule before starting the Class 1A District 10 playoffs at home against BCLUW on Monday. Plett said this was a great win for his guys to jump into postseason play, but they have to replicate it against a Redhawk team that beat them by 10 points the last time the two faced. North Tama and GMG will play their final regular season game tonight at 7:15 p.m. in Traer. BGM (13-7) — Noah Beck 6 2-4 17, Kyle Cadden 11 8-10 30, Scott Tibbetts 3 2-6 8, Ulises Felix 3 0-2 7, Grant Hall 5 4-4 17, Joe Kasal 0 0-0 0, Mitch White 6 0-1 13, Hunter Rudd 2 0-0 6, Jacob Moel 2 1-1 5. TOTALS 38 17-30 103. GMG (9-9) — Avery Bryant 2 1-4 5, Justin Savadty 7 0-0 20, Kolton Gill 2 3-4 7, Aaron Fleming 11 0-0 29, Brayden Peterson 11 7-12 30, Brock Baldazo 5 2-5 12, Blaze Krull 1 0-0 2, Adam Cox 0 0-0 0. TOTALS 39 13-25 105. 3-Point Goals–BGM 10 (Beck 3, Hall 3, Rudd 2, White, Felix), GMG 14 (Fleming 7, Savadty 6, Peterson). Total Fouls–BGM 21, GMG 24. Fouled Out–Beck, Felix. T-R PHOTO BY THORN COMPTON – The GMG boys basketball team piles on Brock Baldazo after he hit the game-winning shot at the buzzer to defeat BGM, 105-103, in double overtime on Friday in Garwin. Baldazo finished the game with a double-double of 12 points and 15 rebounds. 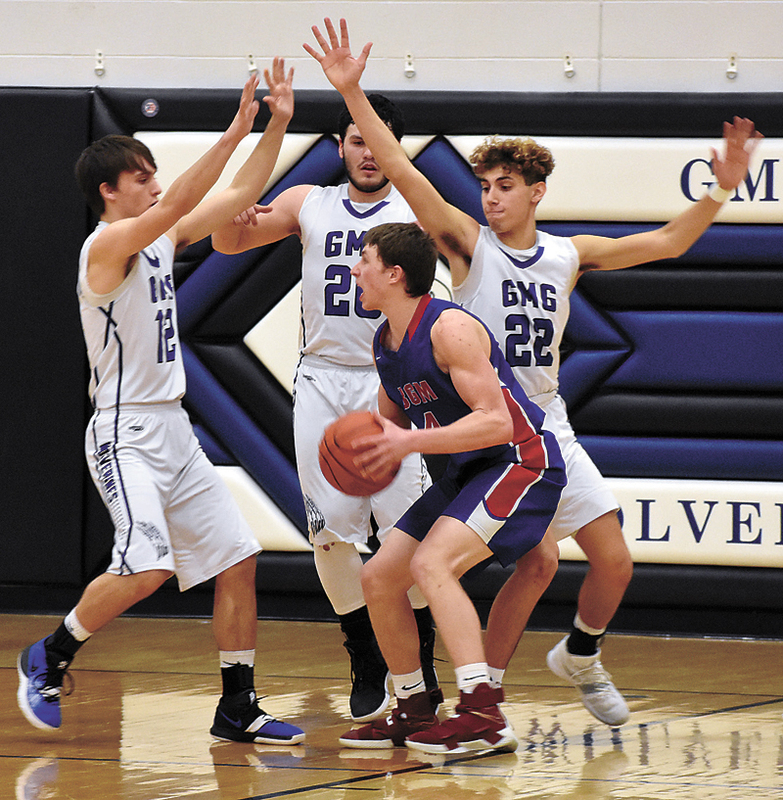 T-R PHOTO BY THORN COMPTON – GMG defenders, from left, Kolton Gill, Brock Baldazo and Brayden Peterson lock down BGM’s Kyle Cadden during the second half of the Wolverine’s 105-103 double-overtime victory over the Bears in Garwin on Friday. T-R PHOTO BY THORN COMPTON – GMG sophomore Emily Vaughn (30) goes for a layup in the second half of the Wolverines’ 50-49 loss to HLV in the Class 1A Region 4 opener in Garwin on Friday night. Vaughn had 10 points in the loss. T-R PHOTO BY THORN COMPTON – GMG senior Kelsey Vaverka (34) pulls up for a shot while HLV’s Kayla Jack defends during the first half of the Wolverine’s 50-49 loss to the Warriors in Class 1A Region 4 playoffs on Friday in Garwin. Vaverka had a game-high 17 points.